Music… the universal language with its mysterious and amazing ability to move the senses and touch the very core of one’s being… the most powerful vehicle ever to carry and preserve a culture through time. In Hawaii, we have kanikapila – that wonderful tradition of coming together to sing and play the old mele of Hawaii. A young man (model: Walt Māhealani Keale) sits by a fire on the beach by Hālona Blow Hole beneath a full moon. 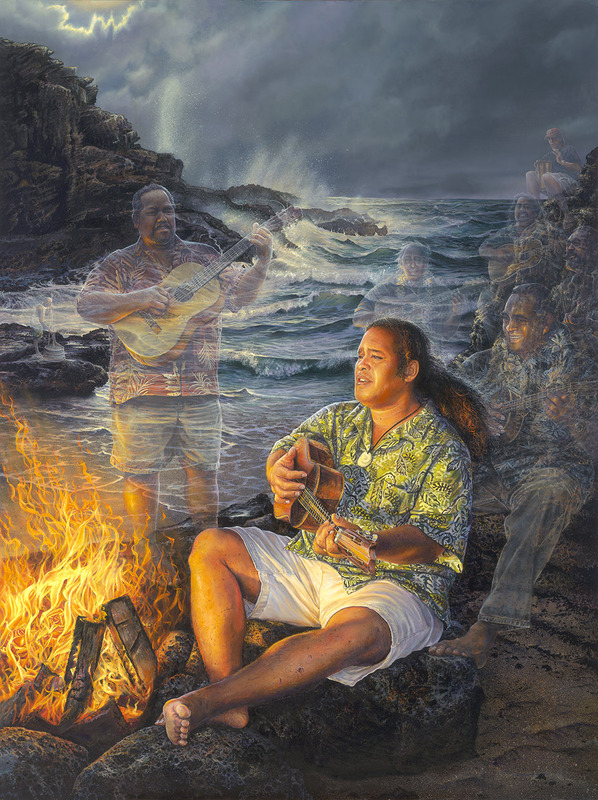 As he strums his ukulele and sings, his music reflects the influence of his mentors, kumu, and kūpuna, (most notably for Keale, two giants in Hawaiian music composition and performance: his uncle Moe Keale [1939-2002] directly behind him and, standing by the fire, kī hō‘alu [slack key] great, Kawika Kahiapo. Kawika and Keale play and sing together in Kaukahi.) I am attempting to paint an “influence” in depicting the spirits of various Hawaiian songwriters and musicians, past and present. They kani ka pila together, their voices and instruments joining with his. They will live forever…because of their music. There is a perfect and beautiful harmony that transcends time and space. It takes the rhythms, melodies, and harmonies of all composers, arrangers, and great performers throughout the centuries, and blends them all together with the voices of today. This unique harmony is ongoing; the individual voices fade in and out and the faces change, but the music lives on – twisting, changing, but never separate from the music of those who sang and played before we did. Think of each “voice” in this “time-line” harmony as a horizontal melody, moving through space. These multiple melodies from yesteryear are interwoven with our current music like a fugue, producing that wonderful “vertical” blend of past and present. Now take this special resultant harmony and let it resonate together with the music of all of nature – the wind, the sea, the birds…and there is music that cannot be described in words; it can only be felt in the very depths of one’s soul. As the strains of this mystical, concerted sound waft high in the breeze, I wish I could simply reach up and grasp a handful and keep it always, but it belongs to another dimension. It is not mine, not yours, but rather “ours”– and yet ours only for this single, fleeting moment. *Faintly visible behind (Walt) Keale’s head is the image of Moke Kealekupuna Wehekealakaluaikahakaaulana Kaaneikawahale of Ni‘ihau (known more simply as Moses Keale), grandfather of Keale and also of Skippy and Israel Kamakawiwo‘ole. ‘Ōhāhā ka hua kūpuna – Because of the fruit of knowledge from the ancestors, we flourish.